Ultra-mild, anti-ageing and fragrance-free 24 hour moisturiser for all skin types. Packed with vitamins, minerals and essential nutrients this moisturiser is deal for senesitive skin, an will leave skin soft and nurished all day. Contains organic evening Primrose, Avocado, Squalane from Olive, Green Tea, Baicalin & Seaweed. Baicalin extract is a fantastic cell rejuvenator, proven to actively reduce wrinkles and the Botanical extracts help to support natural skin health and moisture balance. This product is made without Parabens, Lanolin, alcohol (ethyl alcohol, ethanol), artificial perfumes, petrochemicals, phthalates and colourants. Directions for use: Apply night and morning to cleansed skin. Ideal for use after Neutral/Scent Free Cleanser. Aqua (spring water), butyrospermum parkii (shea) butter*^, glycerin* (vegetable derived), helianthus annuus (sunflower) seed oil*, olea europaea (olive) fruit oil*, squalane (from olive oil), cetyl alcohol (emulsifying plant wax), cetearyl glucoside (plant derived emulsifier), cetearyl alcohol (emulsifying plant wax), elaeis guineensis (palm) oil*^, simmondsia chinensis (jojoba) seed oil*, glyceryl stearate (plant derived emulsifier), aloe barbadensis (aloe vera) leaf juice powder*, perilla frutescens (perilla) seed oil*, oenothera biennis (evening primrose) seed oil*, persea gratissima (avocado) oil*, baicalin (baical scullcap extract), rosmarinus officinalis (rosemary) leaf extract*, camellia sinensis (green tea) leaf extract*, althaea officinalis (marshmallow) root extract*, persea gratissima (avocado) oil unsaponifiables, propanediol (from corn starch), hydrolysed jojoba esters (from jojoba oil), fucus vesiculosus (seaweed) extract, sodium stearoyl glutamate (plant derived emulsifier), gluconolactone, sodium benzoate. 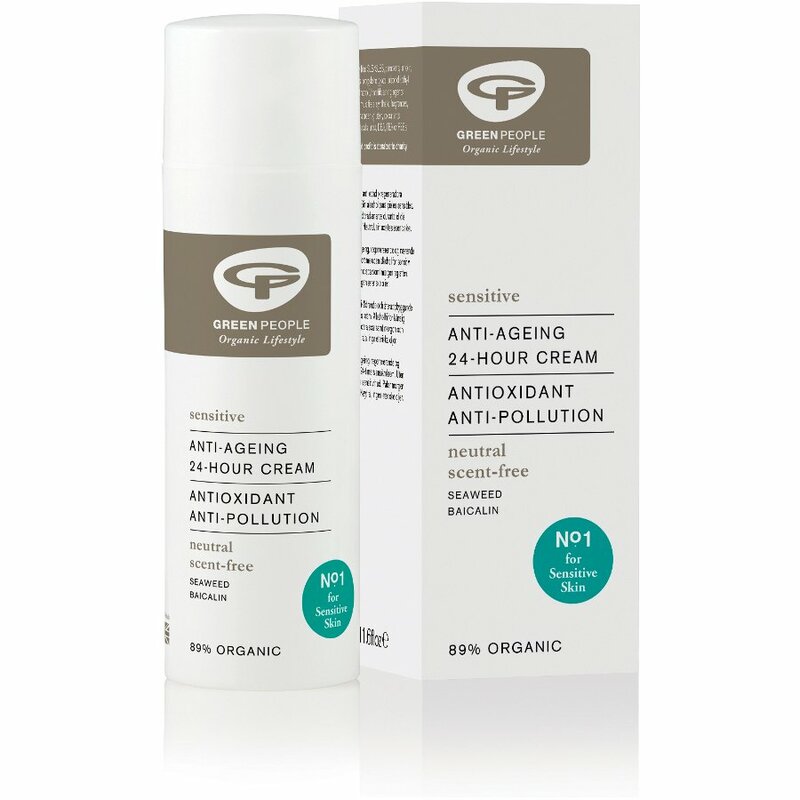 The Green People Scent Free Anti-Ageing 24 Hour Cream - 50ml product ethics are indicated below. To learn more about these product ethics and to see related products, follow the links below. I have used Green People products for some time and I rate them highly. I like the scent free range as my husband has a problem with the aroma of many products. This is also a great moisturiser. 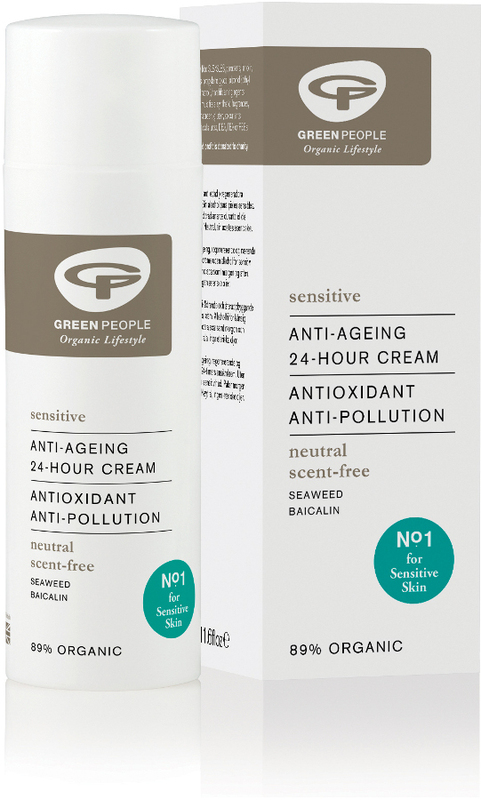 There are currently no questions to display about Green People Scent Free Anti-Ageing 24 Hour Cream - 50ml.